The Briggs & Stratton P3000 will keep you running! Summary : If you’re looking for a solution to keep running – even while off the grid -- this inverter is definitely one that fits the bill. I was having a conversation recently with one of the 50 Campfires editors. He is planning on selling his pull-behind camper. 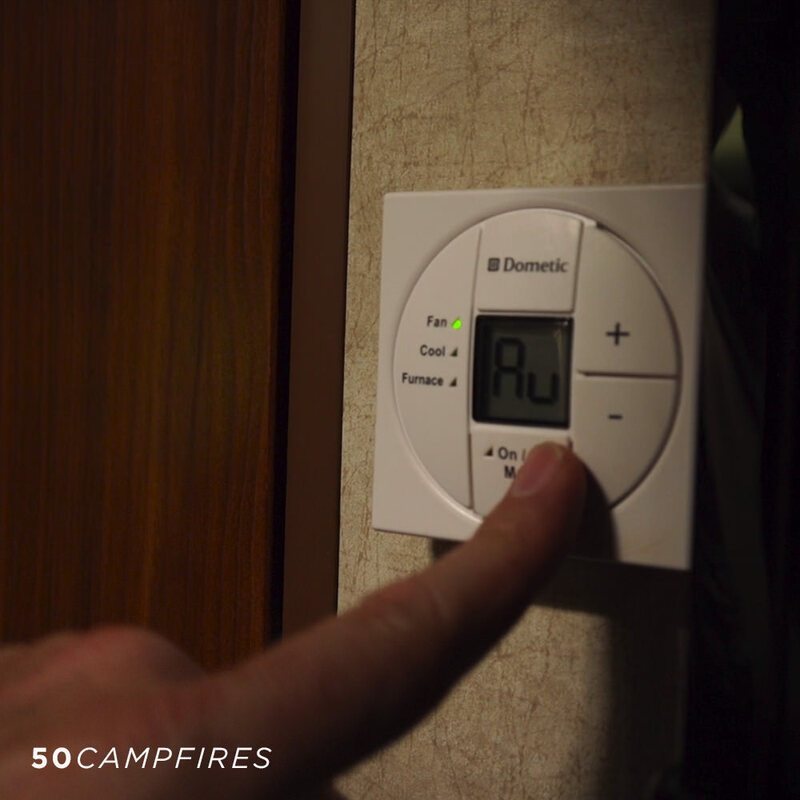 It isn’t that he doesn’t love using it, but rather because of an issue that many RV and pull-behind owners face: it’s almost impossible to spontaneously go out for a weekend, because most electrical campsites book up months in advance. It was a sad realization, and one that many campers face every summer. 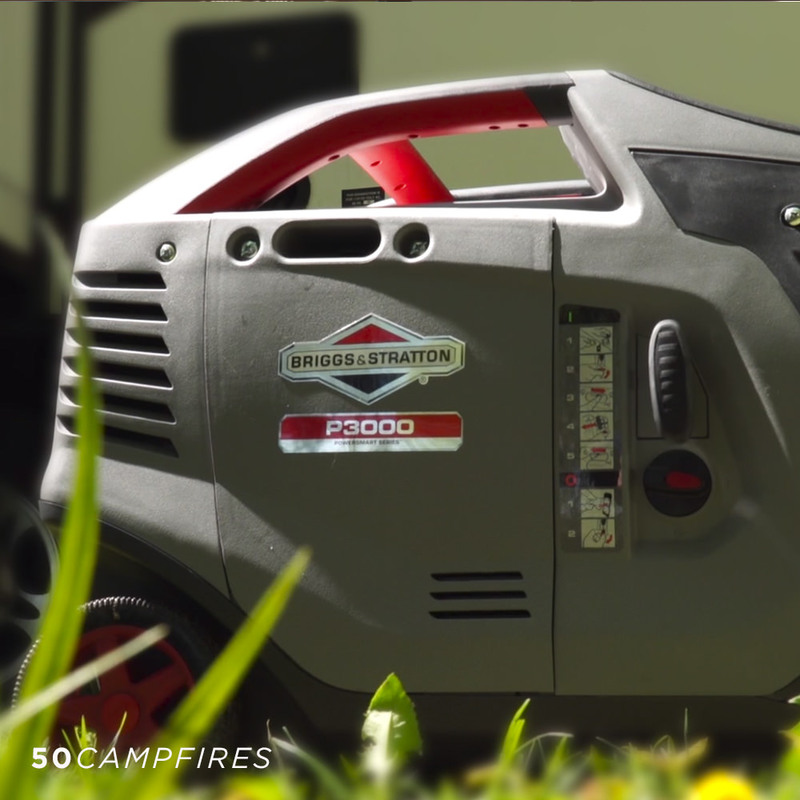 We recently got our hands on a Briggs & Stratton P3000 Inverter Generator, and while it’s designed to handle everything from powering a camper to emergency home back-up, the conversation I mentioned got me thinking – could this be the solution to the issue plaguing millions of campers? Imagine this: It’s Monday afternoon – and you’re sitting at your desk in the office. The forecast for the weekend is perfect. It’s time to get the family into the woods for a little nature time. You log on to the State Parks website, only to find that all the electrical sites are booked up – with some limited availability mid-week. Fear not! By adding an inverter generator to your rig, you can easily book a pull-through rustic site – and live with the comforts of home all weekend. I’ll stop fantasizing now, and get onto the actual review. However, I hope this thought helps, and prevents many more unused campers from meeting a Craigslist fate. 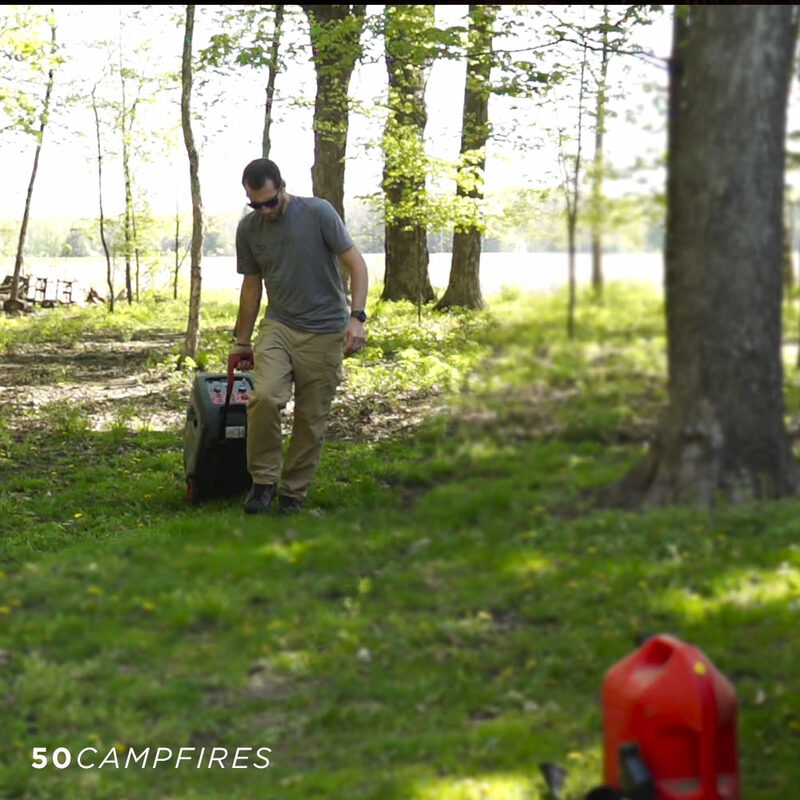 For a limited time, enter to win a Briggs & Stratton P3000 Generator from 50 Campfires! First off, there’s a difference between a standard “generator” and an “invertor generator.” The Briggs & Stratton P3000 is the later. A generator runs at full power, full time. This means that it’s outputting the same amount of power, regardless of if you’re pulling – or even needing that power. This results in much higher fuel consumption, as well as a louder overall unit. 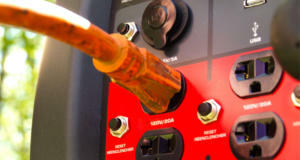 The P3000 is an invertor generator. Simply put, it only outputs as much power as you need – or are trying to pull. This results in a few benefits, including a quieter run volume (58 decibels!) and lower fuel consumption. In fact, the P3000 runs so quietly, it barely exceeds the volume of a normal conversation – keeping it well within the limits of “quiet hours” at the campground. We pulled our 19’ camper into a rustic campsite on a Friday afternoon. Granted, it was in mid-May, but we showed up without a reservation. After getting camp all setup, we rolled in the Briggs & Stratton P3000 inverter generator. 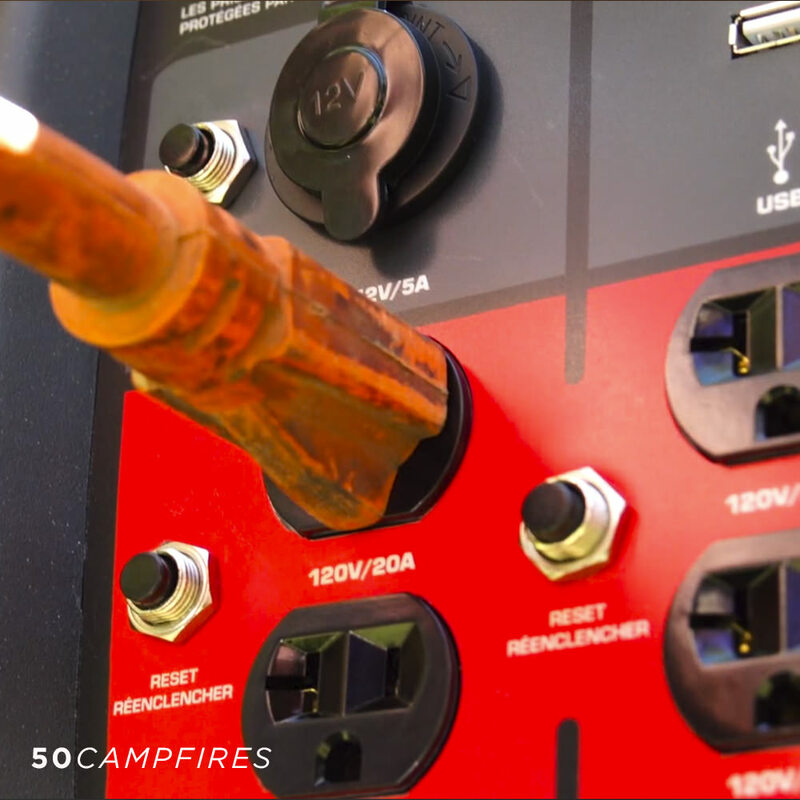 Out of the box, the P3000 comes equipped with a 30 amp adaptor, which made it super simple to connect directly to our trailer’s main power input. The nightmare that often comes with pull-start engines has become deeply engrained in my brain. Every spring, the task of getting the lawnmower and weed whackers up and running often leaves me with sore arms – and a volume of cuss words that I try to mask from the neighbors. I went into the P3000 with this mindset. I can honestly say that I was shocked (and pleasantly surprised) when the Briggs & Stratton P3000 started on the first pull – directly out of the box! We simply followed the quick-start instructions, and had zero issues. As a test, we decided to put the unit through its full paces. First, starting up the standard appliances – refrigerator, air conditioner and lighting. As each appliance was flipped on, the P3000 picked up a little extra engine noise, but quickly settled itself back down to its normal operating volume. As I mentioned above, it’s delivering as much power as you’re pulling – so the engine needs to ramp up with each additional power requirement. 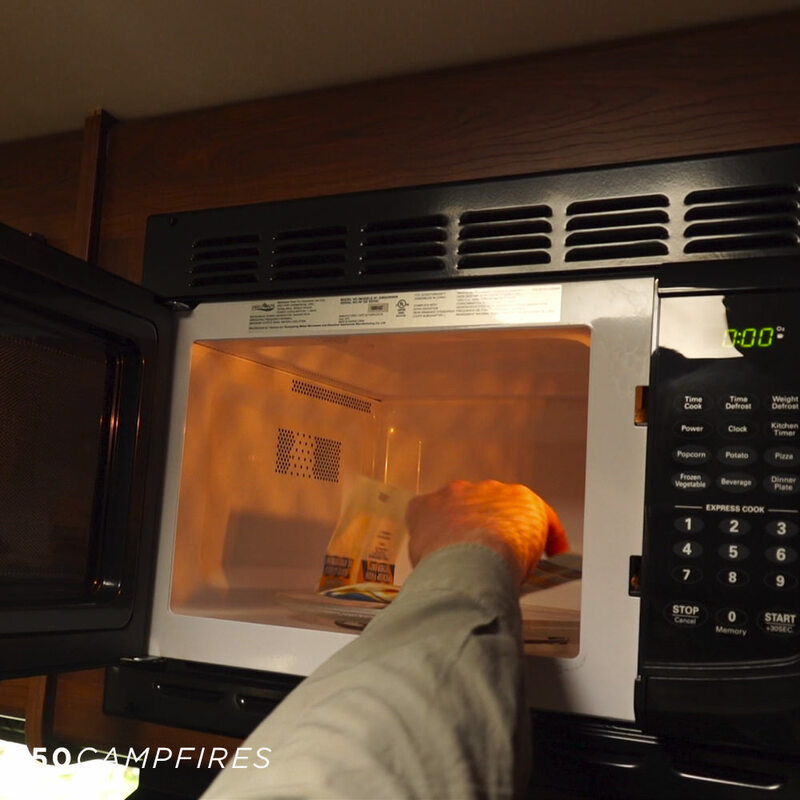 Lastly, we went for what has traditionally been the “big boy” inside the rig – the microwave. We placed a pack of microwave popcorn inside, and let it fire. Again, the P3000 kicked up – and then calmed itself back down. No issues. One of the things that I should point out is the benefit of the Briggs & Stratton StatStation display. Although it might sound simple, this digital readout shows you exactly how much power you’re sucking – and prevents a nasty power overload. In addition to the camper connection, we decided to take advantage of the 4 onboard 120V outlets, as well as the USB connection. Because we often travel with lots of gear, these dedicated outlets came in handy – providing a charge to our camera and microphone batteries with ease. And while a USB outlet might seem like an afterthought, we loved the fact that we didn’t have to waste one of the 120V outlets just to charge up the phone. While all of the focus so far has been about connections and power output, I should mention that the portability and design of the P3000 is fantastic. It boasts a pair of attached wheels, as well as a luggage-style handle that made transporting the unit back and forth a breeze. 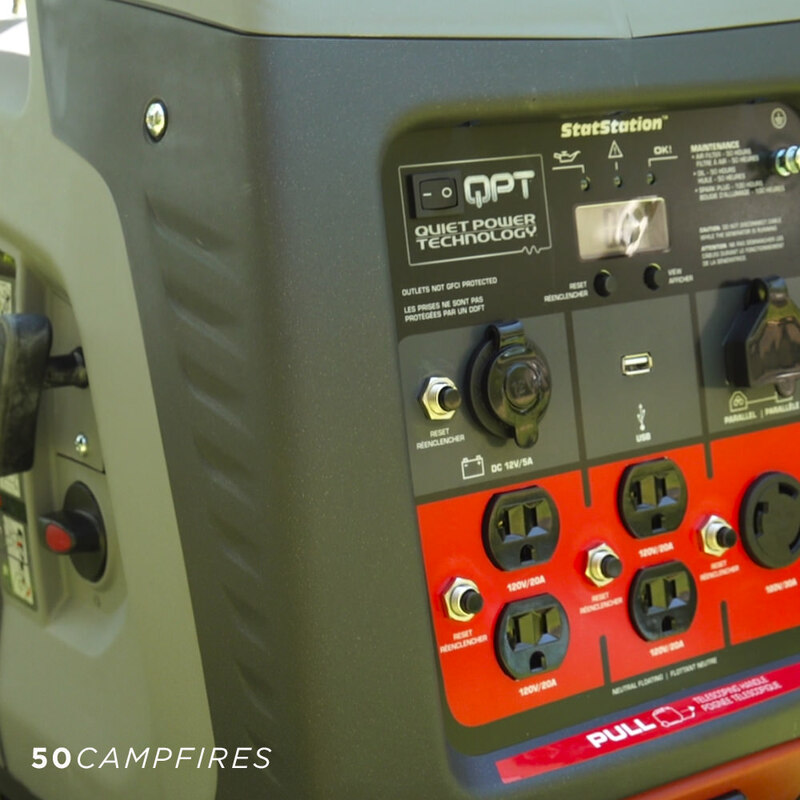 The Briggs & Stratton P3000 Powersmart Inverter Generator held up to any job that we could toss at it. 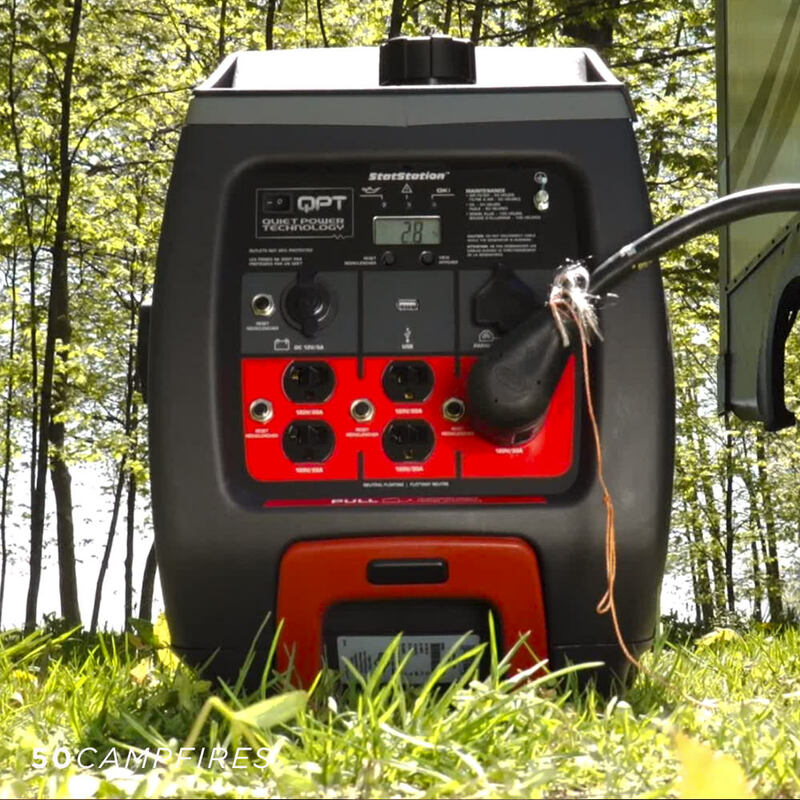 If you’re looking for a solution to keep running – even while off the grid — this inverter is definitely one that fits the bill. 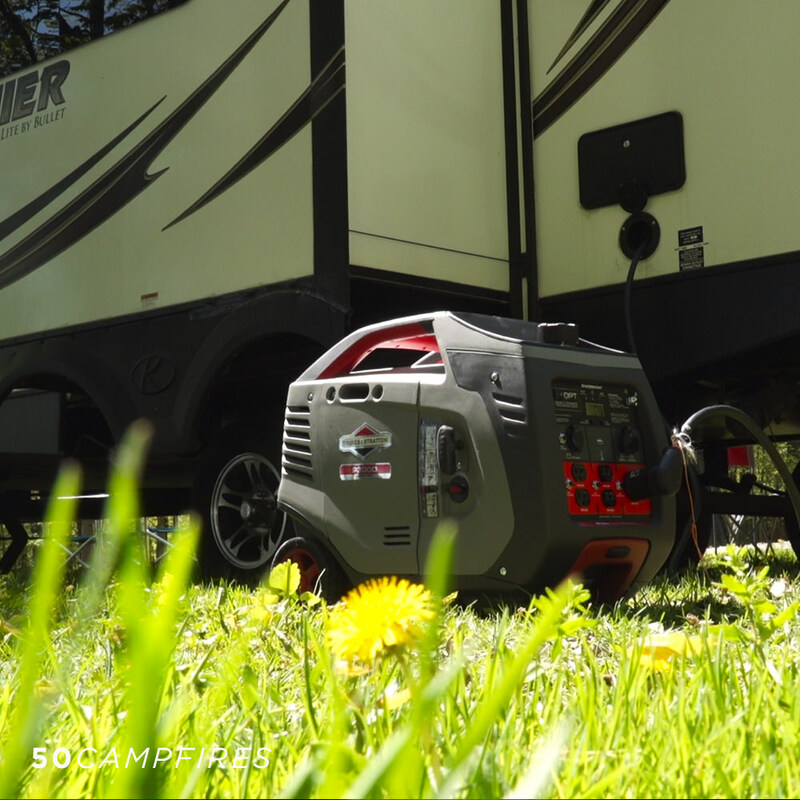 With a legacy of great engines – Briggs and Stratton understands the modern camper. Next: Camping Gear from the Hardware Store – that’s Great Hardware!